I read with interest your articles on world population. (Now We are Seven Billion page and A Tale of Three Islands ECONOMIST vol. 402 no. 9756) Your evocative graph on page is so regular, unlike other statistics, that it suggests a single mechanism. This is the more true when you consider that breaking down the world into three levels of development shows the same curve for all three – some are simply farther along. As it stands this is good news. From that alone one might actually believe the population will stabilize. But the situation is unstable. Hidden in the numbers is the fact that age of first marriage in most developed countries is rising according to a stereotyped pattern. 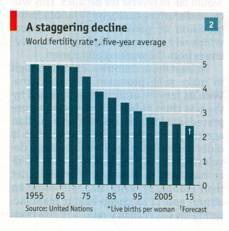 Fertility falls and stabilizes and simultaneously marriage age starts upward. This rise cannot go on forever. I have taken an interest in this and struggled to work out what the mechanism might be. I find it very strange that experts in the various fields this impinges on are almost totally uninterested, perhaps frightened. You would think I was guiding them to the Tree of Life in the Garden of Eden and they were spooked by an angel with a flaming sword. Whatever the mechanism is, it has been well documented among animals. Thank you for your abiding interest in this most important of all subjects. At least somebody is not afraid. There have been 29,832 visitors so far.